George Potter Vanderveer, 19, is remembered as the first soldier from Ocean County to have died from combat in WWI – a war the United States entered 100 years ago. While the county looks back at its WWI history with special historical events this year, the annual ceremonies held each Memorial Day dutifully recognize soldiers such as Vanderveer, a young man who paid the ultimate price in serving the country. 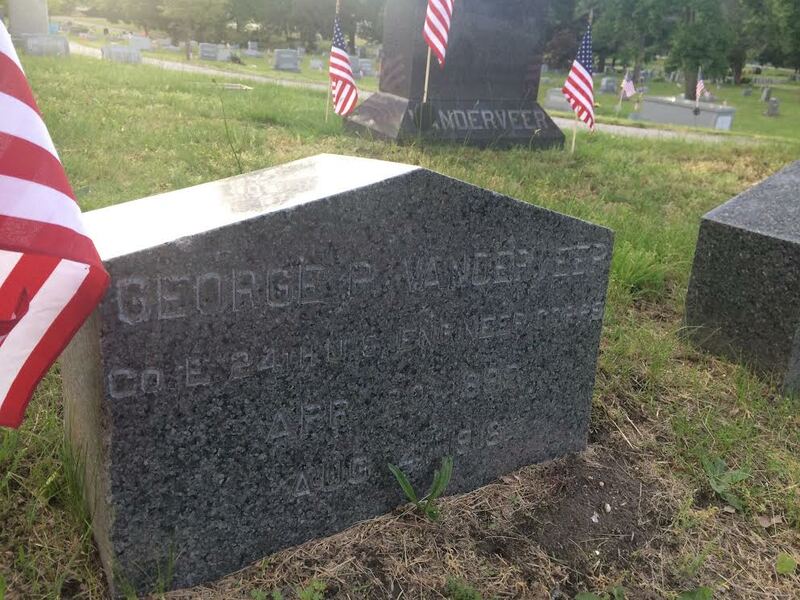 Scout troops volunteer to place new flags and tidy markings on grave sites such as Vanderveer’s, who is buried in Riverside Cemetery in Toms River, his family plot showing he predeceased his mother Euphemia and his father Charles. 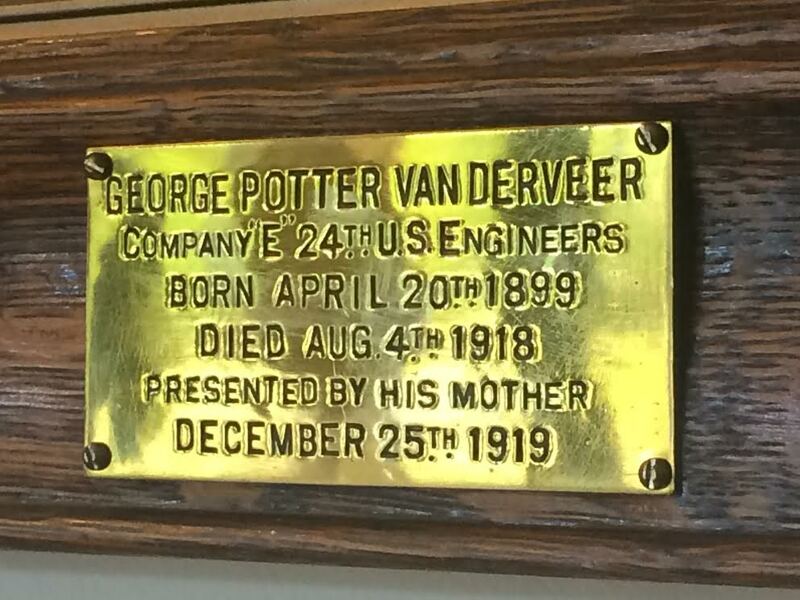 George Potter Vanderveer is also remembered to this day as the namesake for one of the county’s first and largest American Legion posts – Post 129 on Church Road in Toms River. The post will hold its Memorial Day ceremonies on Monday, after participating in the parade down Main Street, to honor all who died as a result of military service. Come 1919, it will mean 100 years since the American Legion was formed out of WWI. 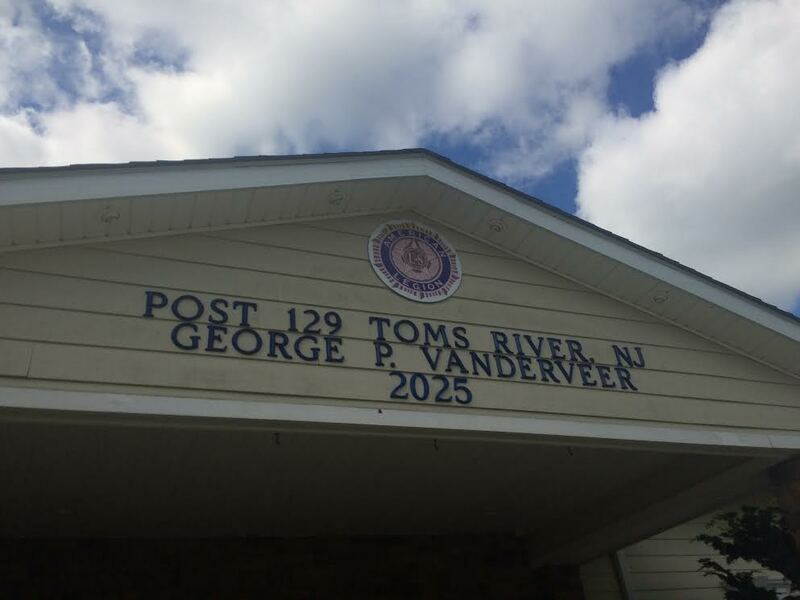 Post founders decided that year to name the post after Vanderveer, said Bob Scheiderman, historian for American Legion Post 129 of Toms River. Vanderveer was just 19 when he died on August 4, 1918, after suffering the gas attacks of WWI combat and subsequent shell shock. He convalesced at Fort Porter near Buffalo, NY. In marking 100 years since the U.S.’s entry in to WWI, the Ocean County Freeholders and County Historical Society held a special ceremony April 6 that explained how county residents greeted news of the war as its young men would begin to be drafted in May 1917. Flags, noting how many men from the town were serving, were hung from churches, town halls and meeting places. Each star sewn on these flags represented another soldier. There were 2,433 Ocean County residents who fought in WWI and 75 men who gave their lives in it. 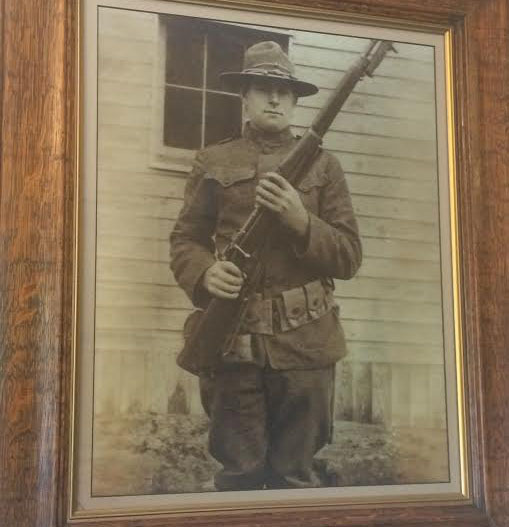 Vanderveer was the first fatality from Ocean County, and a photo of him in uniform, holding a rifle outside barracks, graced the cover of the county anniversary program, and the same photo also hangs in the foyer of the Toms River American Legion Post. Scheiderman said it is the photo George’s mother presented to the post in 1919 at its ceremony. Vanderveer and his family lived in Bayville. A photo in Al Stokley’s book Images of America: Berkeley Township shows a young George Vanderveer on the bank of Cedar Creek, a quintessential Bayville pastime enjoyed to this day. After the draft, enacted May 18, 1917, when the United State Congress passed the “Selective Service Act,” Vanderveer served with Company E 24th US Engineers. In Ocean County, the first draft took place August 1917 with an initial quota of 169 conscripts, according to the county historical society. Soldiers gathered September 19 on the county courthouse steps for a public send-off before heading to training at the new Camp Dix. The grueling war had been raging for three years before the U.S. entered the fight, where horrors of trench warfare and gas attacks reigned for two more years. The war would end November 11, 1919, about three months after Vanderveer’s death. At armistice, the Toms River American Legion Post had just been formed, first with a temporary charter in September, said Scheiderman. Seven local WWI veterans met at the courthouse on October 21 1919, to form an American Legion Post. The meeting was presided by Judge William Howard Jeffries, with Leo Babchin a Lakewood hotelier, representing the American Legion Dept. of NJ. On October 27 1919, a motion to name the post after George was moved and approved, Scheiderman said. Weeks later came Armistice Day, as Veterans Day was then named. Honoring Vanderveer and all who died in military service is the focus of Memorial Day. But days before, preparations are made by groups such as Toms River Boy Scout Troop 20, who each year place fresh flags at veteran and soldier gravesites. Troop Leader Mathew Sohl said that every Memorial Day, the boys from Troop 20, chartered by Toms River Veteran’s of Foreign Wars (VFW) Post 6063, place fresh flags on the graves of the hundreds of U.S. Veterans buried at the cemetery. The flags are generously provided by the NJ VFW. “For about the past five years, the boys have worked to assist the VFW Post with their Memorial Day obligations. The boys have occasionally sold poppies, but they always prepare the graves of Riverside Cemetery. Further, we always participate in the TR Memorial Day parade and join the veterans for doughnuts back at the VFW Post afterward,” said Sohl. He said the Scouts make sure to pay extra attention to the graves of George P. Vanderveer — namesake of American Legion Post129 — and A. Jay Weeks — namesake of VFW Post 6063. The Scouts make sure to have the Vanderveer grave ready for the American Legion Honor Guard that visits the grave on Memorial Day. Scheiderman spoke with pride over the details meant to memorialize the post namesake. As the post historian, Scheiderman has ledgers of notes he keeps outlining those initial post events upon its founding. As parades greeted returning soldiers and celebrated the end of war in 1919, patriotism swelled, but the effects of war bore across Ocean County: infrastructure such as the war hospital in Lakewood on Clifton road tended to those injured, Camp Dix would transition into Fort Dix, and the term “shell shock” described the psychological impact soldiers face, often akin to the Post Traumatic Stress Disorder epidemic today’s veterans face today. Scheiderman described efforts the Vanderveer family took to help the post memorialize George. For more on New Jersey’s history in WWI, visit the state’s centennial website at http://www.worldwar1centennial.org/nj-wwi-centennial-home.html. Catherine Galioto, the article’s author, is also a member of the Post 129 Ladies Auxiliary.